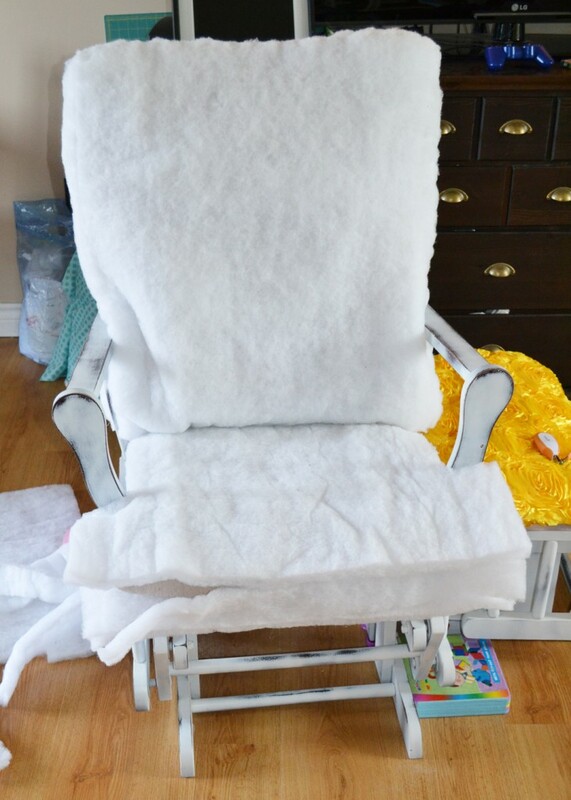 You know the early-90’s-ish glider rocking chairs you can buy from big box stores for your nursery? The ones that are beige coloured and “blah”? We had to snap one up when our first baby was born. Do you know why? Because the thing was just so darn comfy! With baby number two now here and with the fact that we had to move the glider to the living room due to space issues, I thought it was time to update the chair to make it more modern and fun looking. To be honest, I found this project quite challenging – a definite “labour of love”! I really like the results, though, and the hard work was well worth it. Remove all of the cushions from the chair and the ottoman if you have one. Paint evenly with spray paint outdoors, following the paint’s directions. 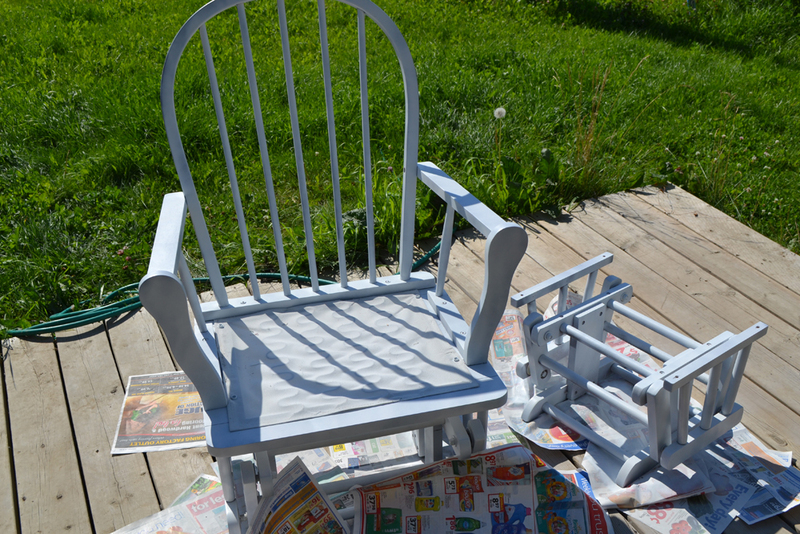 I decided to distress the paint with sandpaper, sanding all of the edges of the chair as shown above for a shabby chic effect. This works well if you’re painting over a dark coloured stain. In my opinion, something that really dated the look of this glider was the rounded back cushion with the buttons. I covered the entire cushion with thick batting and squared the corners (I stuffed the corners with polyester batting to fill them out). I also cut strips for the edge of the cushion, making it have a “boxier” look. I hand-stitched the sides to the front and back loosely, just to hold it all in place over the old cushion. 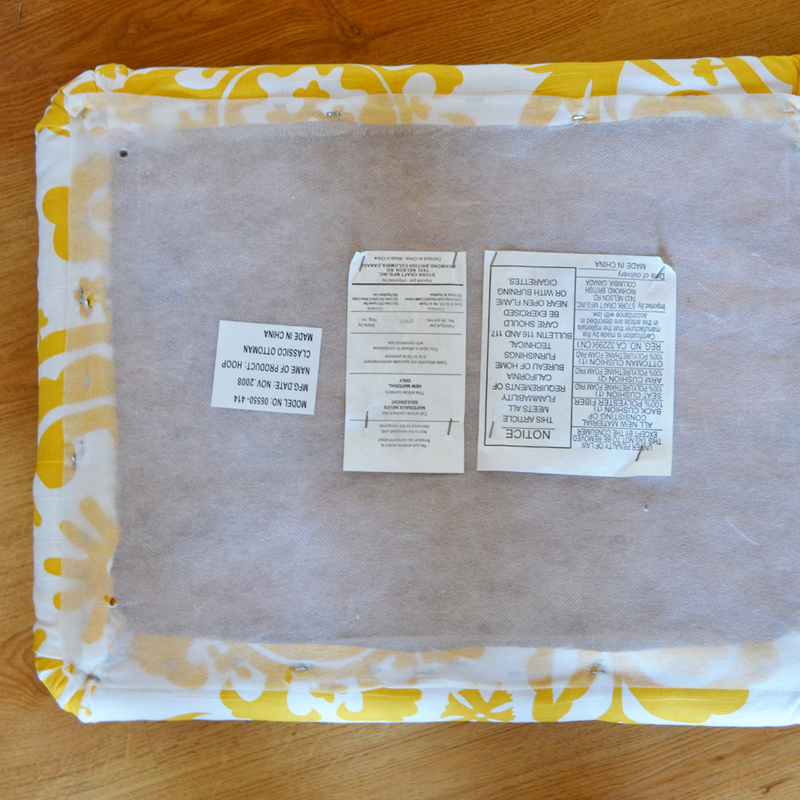 I repeated this process for the seat cushion. Next, make some piping if desired for the edges of the cushions (I definitely wanted some on mine to define the edges and give my cushions some interest). Measure the diameter of your cushions and multiply that number by two to determine the length of piping that you need. 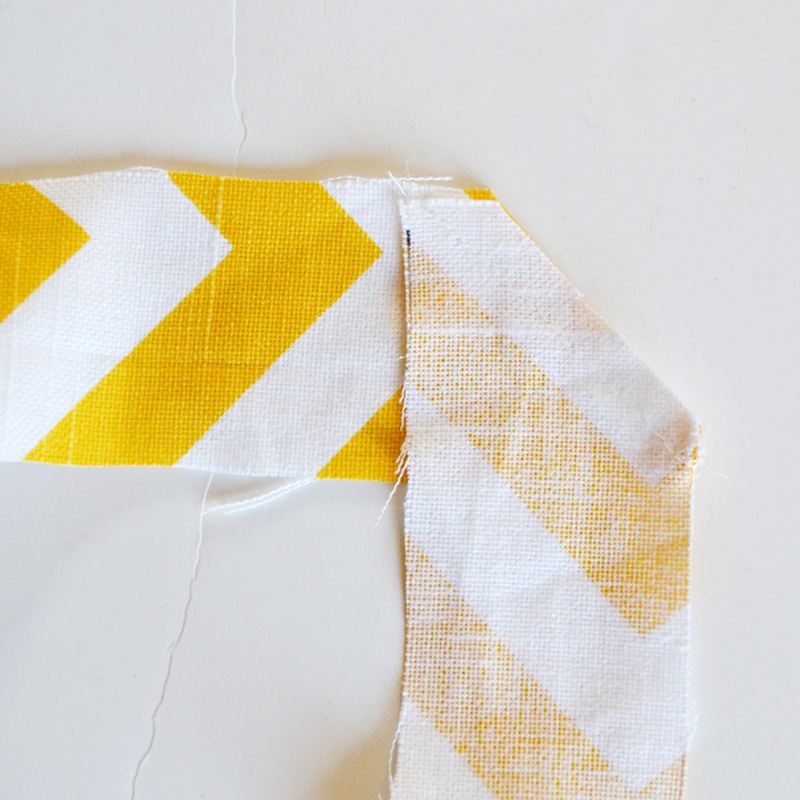 Cut 2″ wide strips of fabric and sew them together at an angle (like the first photo above). Fold them over some piping cord and sew to secure (like the second photo above). Measure both of your cushions carefully and cut out the front and back pieces for each cushion based on your measurements. If you’re using a largely patterned main fabric like I did, make sure you decide whether or not you want to center any motifs on the cushions and cut accordingly! Cut the side, front and back rectangular pieces from your contrasting fabric based on the measurements of your cushions and the thickness of your cushions. 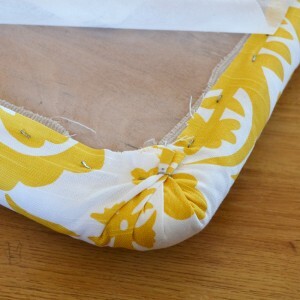 For the back of the seat cushion and bottom of the back cushion you will be sewing a zipper in, so cut this piece 1 inch deeper (higher) and then cut in half lengthwise (as pictured in photo one above). 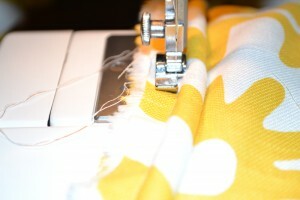 Sew the piping onto the edges of the tops and bottoms of the cushions, meeting the raw edges of the piping with the raw edges of the cushion (as shown in picture two). Where the piping meets, cut the cord so that the beginning and end just meet, and ensure the fabric wrapping it is slightly longer. Then, fold one side of the fabric from right to wrong side to create a finished seam and sew down (as pictured in photo three above). 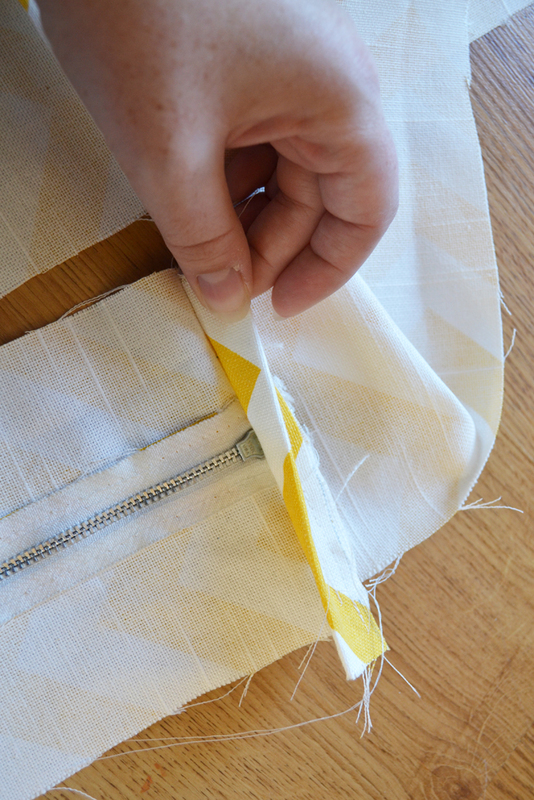 For the side pieces, start with the zipper side and sew the zipper in place – it joins the two narrower strips as shown in the first picture above. 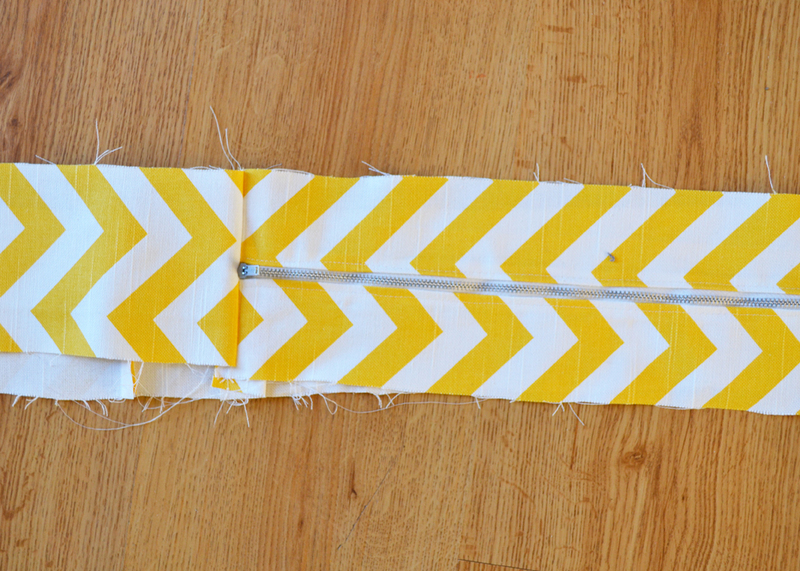 Topstitch, and then fold a scrap piece of fabric in half and sew on the wrong side against the short raw edge as shown in picture two above to create a zipper “stop” that will prevent the zipper from falling off. Now, sew these side pieces to the other front and back pieces of the cushion that you’ve cut out and have added piping to previously. I used a TON of pins for this part, and even then I found it quite difficult to get my seam at a nice location so that the stitch on the piping wouldn’t show. The corners were hard too! I did the best I could by machine, and then hand-stitched the corners and the little mistakes I had made earlier. It worked for me! If your glider has a rocking ottoman, it’s a cinch to recover! 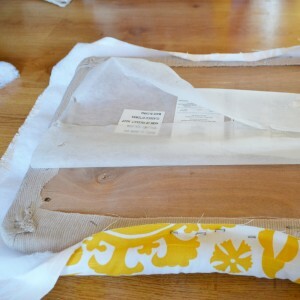 Flip the upholstered piece over, remove the staples around the edges of the bottom covering fabric. 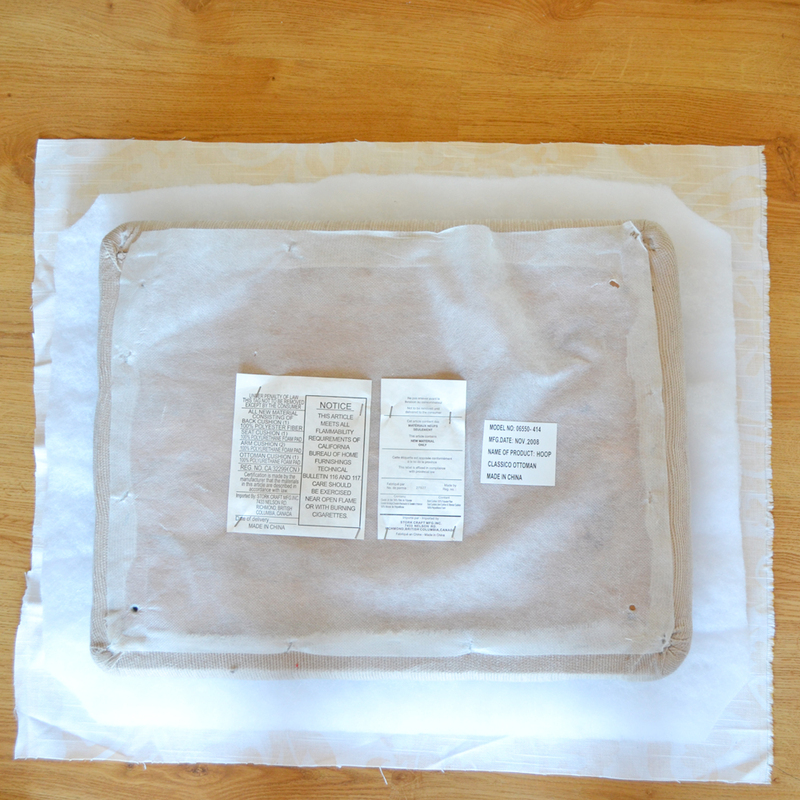 Cut a piece of main fabric and batting about 3″ larger than the ottoman on all sides. 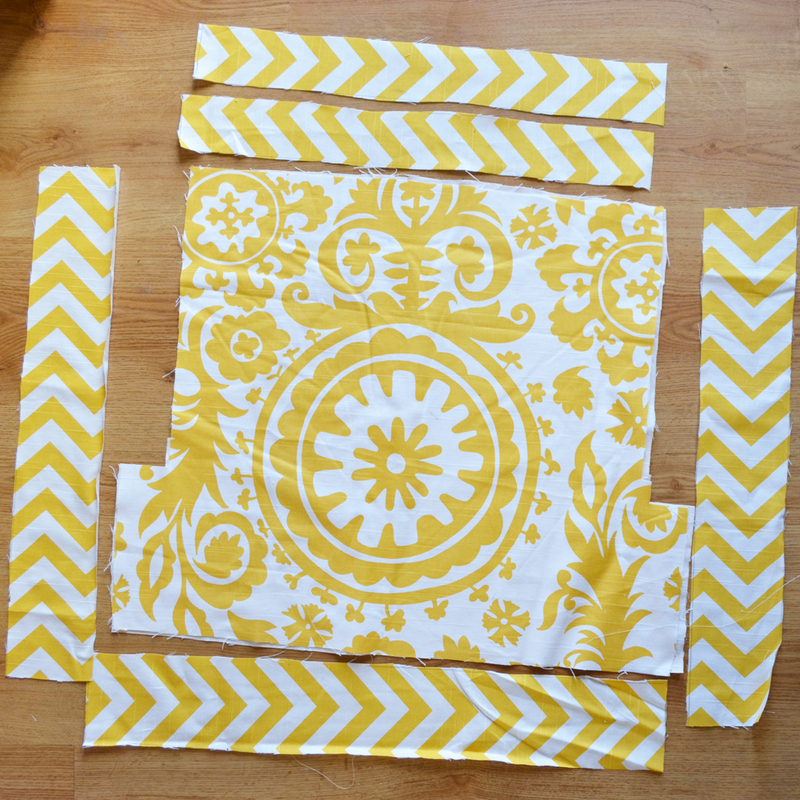 Lay the fabric right side down on the floor, then the batting, then the ottoman (centered). Pull the fabric around and staple it down to the underside of the ottoman on all four sides, tugging gently and smoothing as you go. For the corners, I gently pleated and pulled them to create as smooth a corner as possible (as shown in picture three above). Finally, replace the bottom cover piece with staples. Stuff the cushions into the cushion covers you’ve just made, place them on your glider and sit back to admire your work! I was general happy with my glider update. It certainly was a tough project, but it gave my rocker such a different look and it will look so sweet when we are able to put it in a nursery for my little girlie! 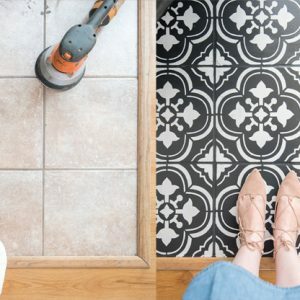 Don’t be afraid to give this project a try! In my opinion, it’s well worth the effort and much less expensive than buying something new. 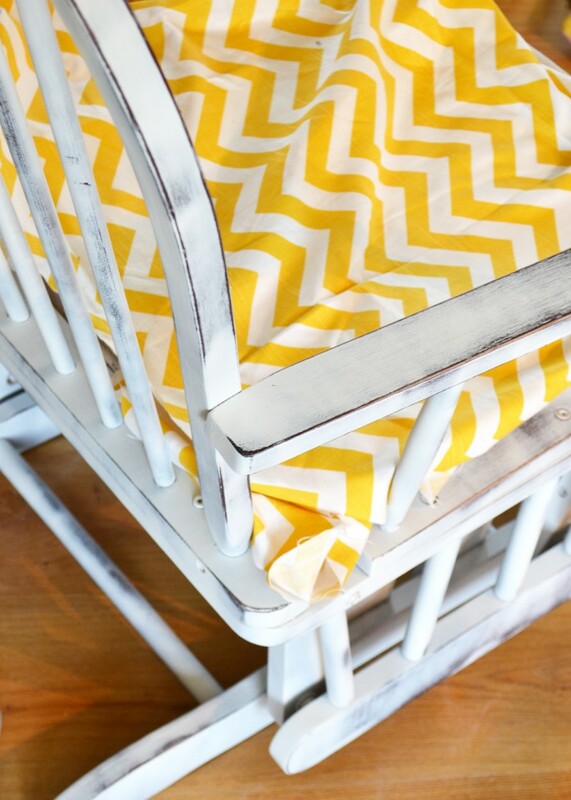 Plus, it’s totally custom and you could make it match so perfectly with any nursery decor! Thanks so much, Gail! Yes, I ended up liking the plain wood armrests better, so I just left them (plus, less work for me!). Thanks for stopping by! I’ve been thinking about this project for a while…you’ve inspired me to be brave enough to try it! Beautiful fabric, too! Pinned it! Thanks a bunch, Carolyn! Glad it’s inspired you – when you finish, I’d love to see pics of your project! What a fabulous transformation! I am hosting a Beautiful Babies month during the month of November (with the anticipated arrival of our baby girl in November). I’d love for you to share this as a guest post if you’re interested! Thank you, MJ. I just emailed you! What a great makeover! Not only is this the best solution, it’s lovely too! Thanks so much for the compliment and for popping by, BT! I am looking forward to updating my glider. Did you sand the chair before painting it? 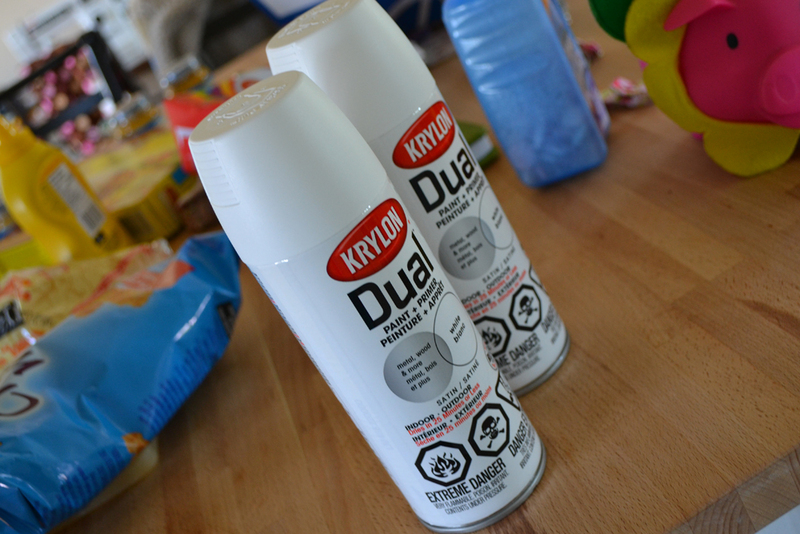 Is there spray paint that will stick to varnish? Hi Jessie! I didn’t sand, but the paint + primer I used seems to stick pretty well to the varnished wood. If you’re worried about paint chipping off later (I’m not for mine because of the distressed look), I’d suggest sanding and sealing the finished project with a water based, clear sealer. 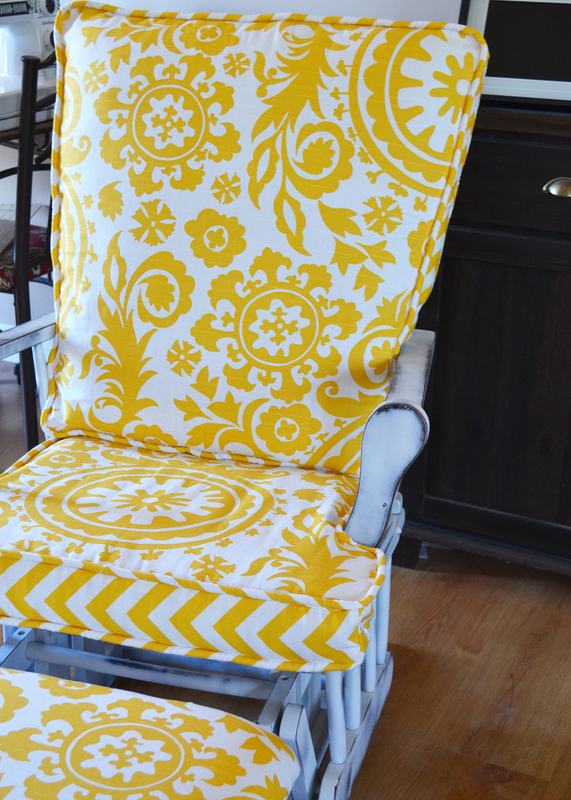 I love this project, I have this exact chair, and this is now my next project! Thanks for sharing! I have no trouble at all believing that this was a difficult project! My Mom recently donated a very similar rocking chair to our church nursery, only the upholstery is a terrible Dusty Rose from the 80’s. You’ve inspired me to try my hand at re-covering it! It was definitely tough, but I think it was totally worth the blood, sweat & tears! 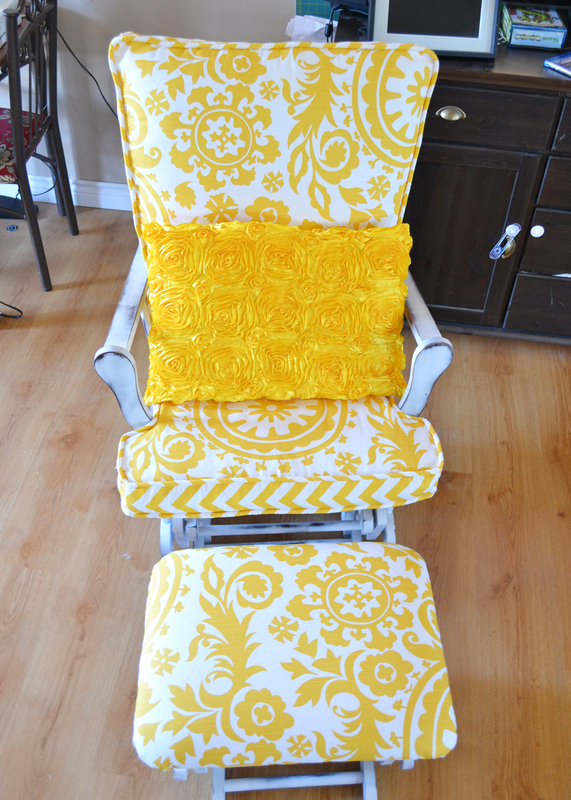 It looks like a much more expensive chair now for only a little money spent on fabric! Hi what premier cotton fabric zig zag did you buy from that fabric website? Do you mind giving me the link? Thank you. Hi, Nour! 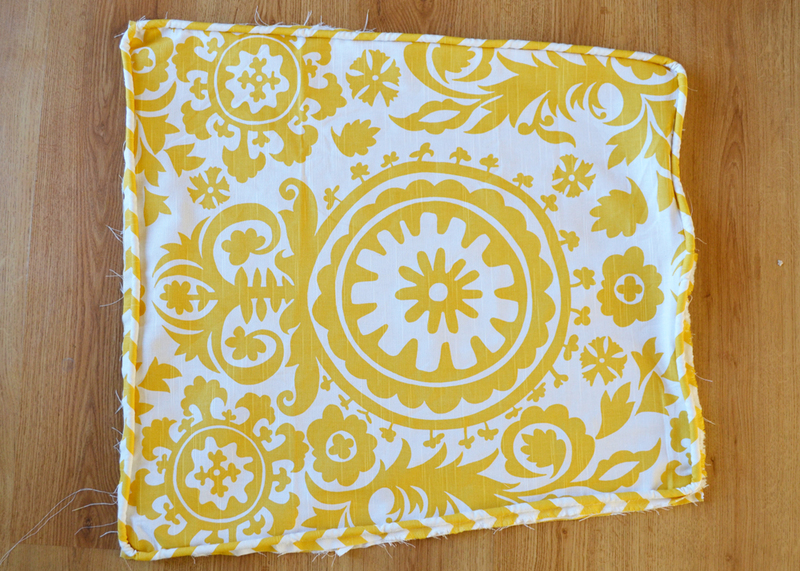 I used this chevron – https://www.fabric.com/buy/uh-224/premier-prints-zig-zag-slub-yellow-white – and this suzani print – https://www.fabric.com/buy/uh-217/premier-prints-suzani-slub-yellow-white. I used lofty polyester quilt batting I had on hand. I enjoyed reading your creativity to up date your glider. However, this requires a skill. Without special skills such as pattern making and sewing, of course, we can not do it. Therefore, I prefer buying seat covers that are ready for use. I’m happy with this way. But, I really appreciate what you do. Upgrade glider is cheaper than buying new. With the up grade, the old seat will be new. We can save costs. 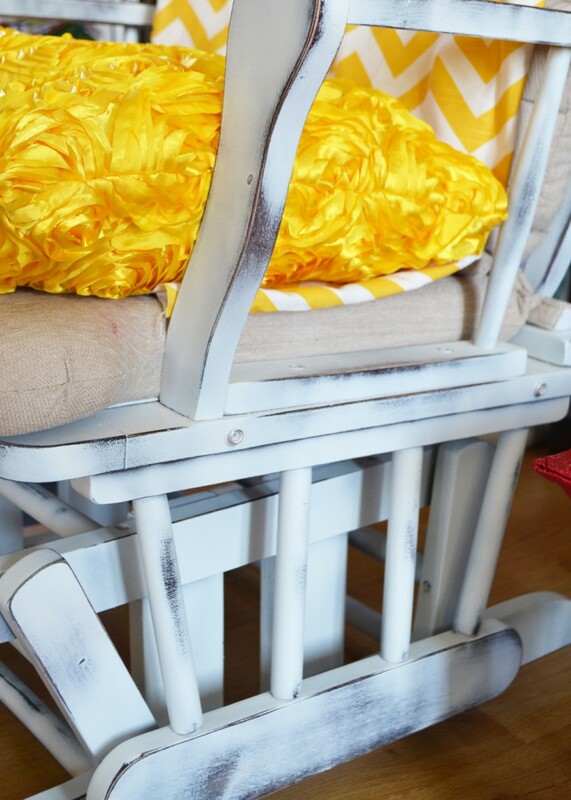 Ita Maulani recently posted..Nursery Rocking Chair: Storkcraft Glider, Babyletto.. Yes! Finally something about tummy tuck. You coud certainly see your expertise within the work you write. I was in the process of planning the re-covering one of these gliders I paid $10 for at a thrift store. 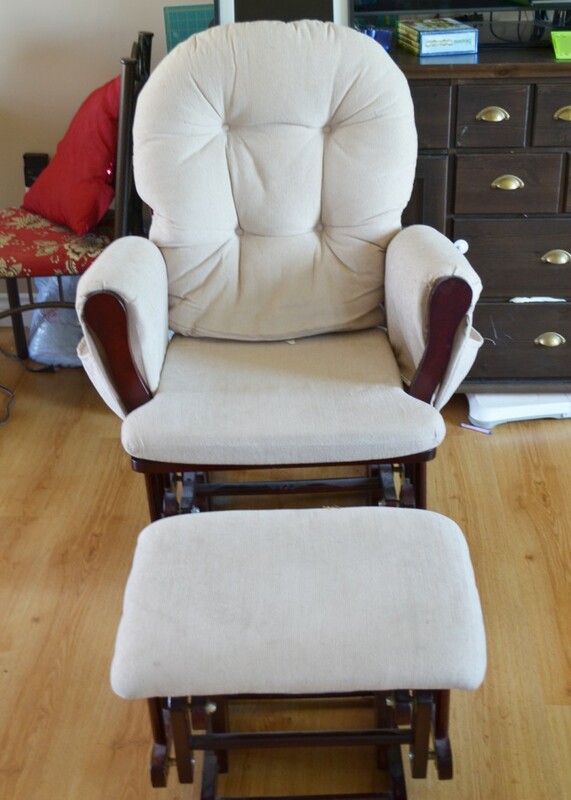 Daughter is pregnant and you need a nice comfy rocker to sit and nurse . My wood needs cleaned on the arm rests, especially, and after that the free standing cushions will be covered with a fleece grey and white modern pattern. I ended up with something like the chevron. So this tutorial was a timely ‘find’! Sadly I do not have the foot rest. 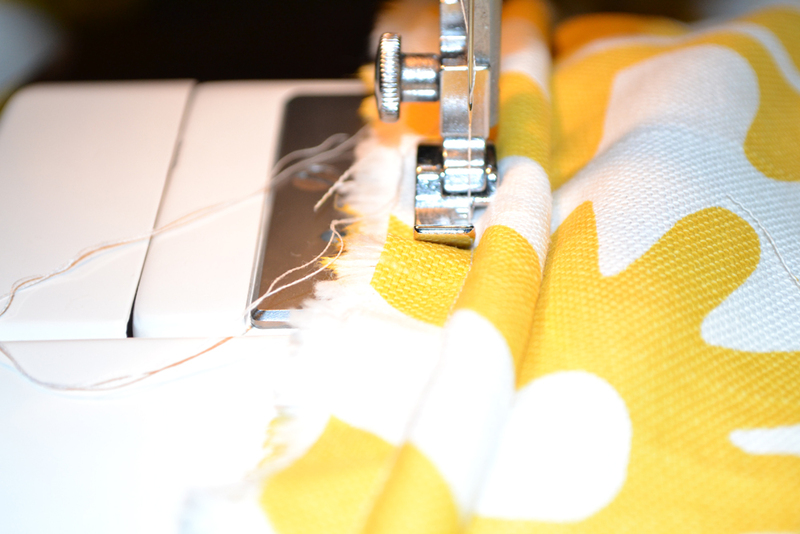 I hope I can get the sewing machine working….it’s been a while! If not I expect I will be hand sewing it! 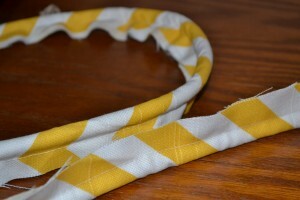 Or maybe I can knot the edges like the fleece blankets!! Haha! 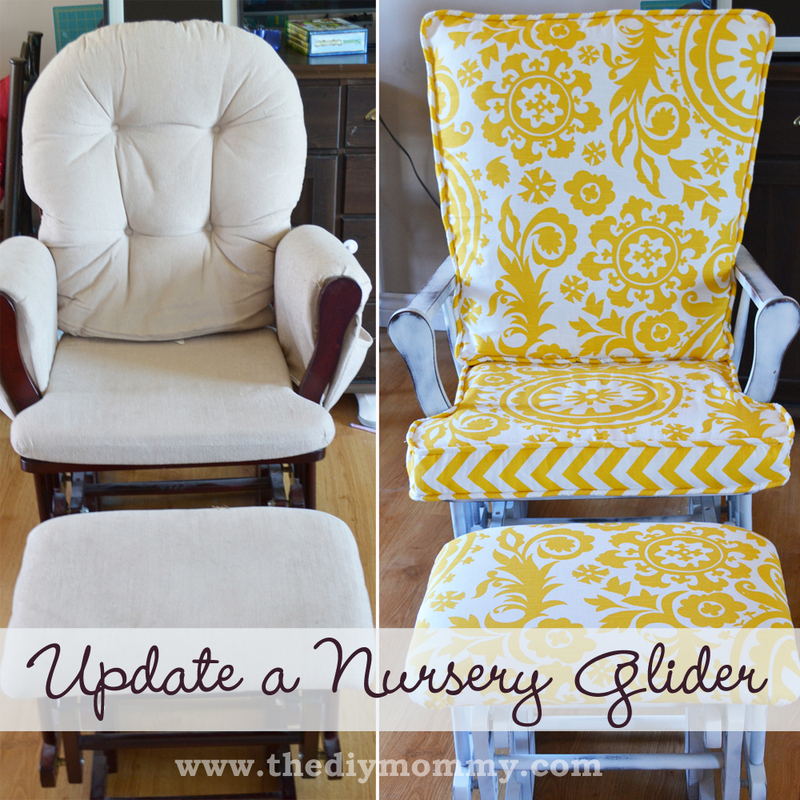 Awesome twist to the nursery glider. I love the rustic looking paint. I think this might be out of my DIY skillset, but after seeing this its worth a try. 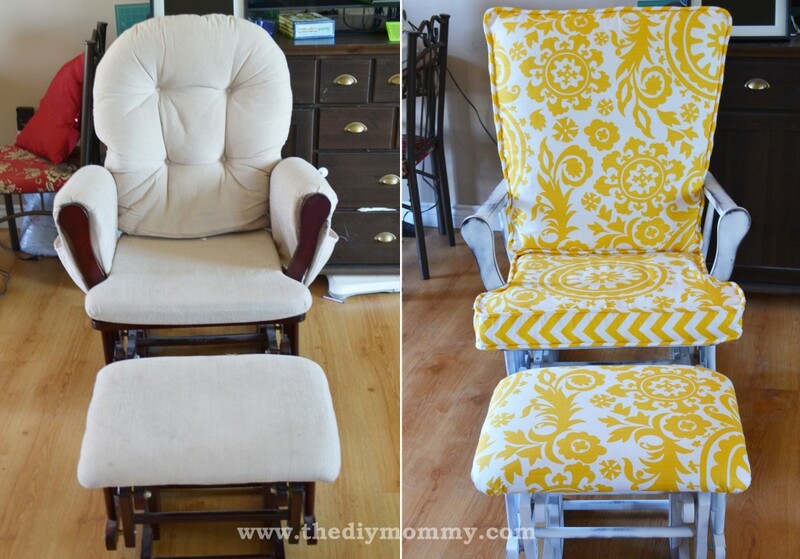 I love this project, I have this exact chair, and this is now my next project! What a great idea!! Thanks for the inspiration! Very well done and nice modern look of the glider. I have an old glider lying around. I am not very skilled with the sewing stuff and would try to buy a ready made cushion. Yeah! 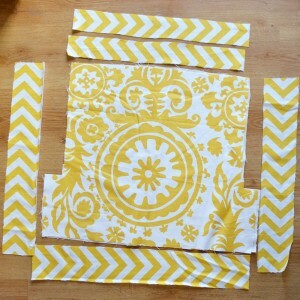 Finally I’ve found an awesome post on custom cushion cover making. Btw, Nice choice! You post inspired me a lot.Keeping sharing my friend.Will try it definitely for mine!